1. From latest GLBT Youth Commission meeting: Massachusetts Dept. of Public Health funding homosexual / transgender movement in schools - to make up for budget cuts! 2. Massachusetts Legislature continues unconstitutional actions - illegally passing laws with no quorum! 3. In pre-Christmas message: Pope continues campaign of truth on destructive nature of homosexuality and transsexuality. 4. Chanukah, coinciding with Christmas this year, offers a lesson in fighting the culture war. 5. Help MassResistance now with an end-of-year donation. It will pay off big dividends! From latest GLBT Youth Commission meeting: Massachusetts Dept. of Public Health funding homosexual / transgender movement in schools - to make up for budget cuts! The madness continues. 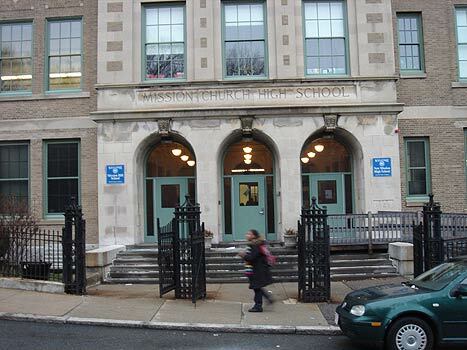 The Massachusetts Department of Public Health (DPH) is giving full support to the homosexual / transgender movement in Massachusetts schools, according to DPH Commissioner John Auerbach (who is "married" to another man). The DPH has given $150,000 of its budgeted money to the Massachusetts Commission on Gay Lesbian, Bisexual, and Transgender (GLBT) Youth to make up for the $150,000 which the Governor cut from the Commission's $850,000 budget in October because of the massive budget crisis in Massachusetts. In other words, money which was meant for public health is now being diverted by the DPH to homosexual programs in the schools. The Mass. Dept. of Public Health will also begin pushing acceptance of "transgenderism" and will even begin bringing transgender people into its leadership roles. Massachusetts Legislature continues unconstitutional actions - illegally passing laws with no quorum! MassResistance planning to file injunction. While you were doing your Christmas shopping, the Massachusetts Legislature was doing a little Christmas shopping of its own behind your back. As we reported back in October, for the last several months - since the "formal" sessions ended last summer - the House and Senate have been meeting with as few as 2 members and conduct business. Hundreds of bills have been passed. Article XXXIII. A majority of the members of each branch of the general court shall constitute a quorum for the transaction of business, but a less number may adjourn from day to day, and compel the attendance of absent members. All the provisions of the existing constitution inconsistent with the provisions herein contained are hereby annulled. A QUORUM - at least half of the members of each branch - is constitutionally required to conduct business. This seems to be pretty clear. The House has 160 members and the Senate has 40 members. On Monday, Dec. 22, the Senate met with 3 members and moved 11 bills forward. The House met with 12 members and moved 30 bills forward, including a watered-down version of the infamous "bullying bill" that MassResistance originally vigorously opposed. On Tuesday, Dec. 23, the House met with 5 members and moved 17 bills forward. On Wednesday, Dec. 24, the Senate met with 2 members and moved 31 bills forward. The House met with 4 members and moved 8 bills forward. Thankfully, neither the House nor Senate met on Thursday (Christmas Day) or Friday. We have discussed this with a number of past and current Massachusetts legislators. No one has been able to give us a definitive answer as to why this is not illegal. We're just told that "that's the way we do things, so it must be legal." But it's not. It's done with a wink and a nod. Here's how they explain it: They call it an "informal" session. They don't record the names of the members present. Everyone knows, of course, that there's not a legal quorum, but they pretend that there is because no one formally calls for a count of the members present. If a member wants to stop things, he just stands and says "I doubt the presence of a quorum" and the meeting ends (until the next day). "Informal sessions" are ways that the Legislature slithers bills through that normally would draw scrutiny if the entire body had to deal with them, but which the leadership wants to get passed. They push bills through that got stopped in committee earlier in the year because of opposition at the time. Make no mistake about this. Many of these laws will affect you personally, and also the way businesses can operate in Massachusetts. Even things as small as bills dealing with illegal parking at bus stops and the way caregivers get consent for things they do with patients - these are laws recently passed illegally, but are still official when the Governor signs them. There are also a large number of "sweetheart" bills that give one individual state or local employee a special exemption from the normal work rule or retirement statutes, or that raise fees for state services, allow zoning abatements, or allow public money to be spent on activities that would be otherwise prohibited. Since there are no roll call votes, no one is held responsible. EXAMPLE: State House News report of Massachusetts Senate from Monday, Dec. 22, with only 3 members present. The Boston press knows what's going on, and they play along with it - mainly because extreme legislation (which the media often supports) gets passed that way which otherwise wouldn't get through. Joking around. 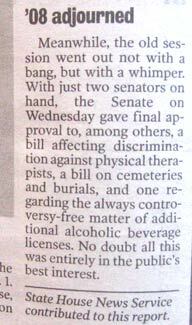 In today's Boston Herald, a political news column mentions that only 2 members were present in Wednesday's Senate session. But no mention of the what the Constitution requires to actually do legal business. It's unbelievably corrupt. And the people of Massachusetts are the losers. In pre-Christmas message: Pope continues campaign of truth on destructive nature of homosexuality and transsexuality. This is another one of those news items completely ignored by the American media (and barely covered overseas). It represents another reason - as if you needed one -- not to trust the mainstream media to report what's really happening. In a pre-Christmas message on Dec. 22, Pope Benedict was pretty explicit about the need to fight the homosexual and transsexual movements, to "protect man from the destruction of himself." We are a non-denominational group, but it's hard not to continually admire the moral courage of the Pope on these issues while other religious leaders are cowering. VATICAN CITY: Pope Benedict said Monday that saving humanity from homosexual or transsexual behaviour was just as important as saving the rainforest from destruction. The Church "should also protect man from the destruction of himself. A sort of ecology of man is needed," the pontiff said in a holiday address to the Curia, the Vatican's central administration. "The tropical forests do deserve our protection. But man, as a creature, does not deserve any less." Of course, the enemies of normalcy in Europe were quick to respond. The Guardian (UK): "The pope's message: A toxic epistle?" Northern Ireland News Letter: "Gay groups attack Pope"
As Pope John Paul II understood very well, the most powerful weapon against the forces of totalitarianism and paganism are truth - and the fearlessness to tell the truth publicly and often. Nothing can stop the truth. It's a lesson for us in the battles we are fighting. Chanukah, coinciding with Christmas this year, offers a lesson in fighting the culture war. Saturday, Sunday, and Monday are the last three days of the 8-day celebration of Chanukah, which this year overlapped Christmas. Most people (including probably most Jews) don't understand the real meaning and significance of Chanukah. Chanukah isn't really anything like Christmas, though you wouldn't know it by the way it's often portrayed these days. Chanukah is about fighting - and winning - a culture war against overwhelming forces trying to spiritually kill a nation. A determined group of religious believers fought back and won against impossible odds. It's a historical event that took place in Israel in 170 BC. It brought Israel back from being permanently taken over by paganism and likely changed the course of world history. Help MassResistance now with an end-of-year donation. It will pay off big dividends! We are preparing for a huge year. Some people are depressed and giving up. Some groups are scaling back. We're going to be moving forward harder than ever. This is too important. But we need money to do it. We really need your financial investment in this fight. If MassResistance doesn't do it, who will? INVEST IN THE FUTURE! Donate to MassResistance!